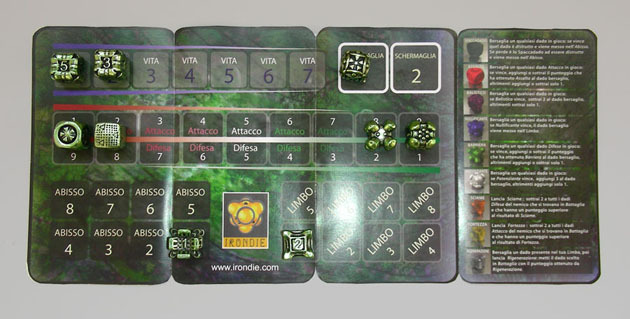 In order to play IRONDIE you need to select 9 dice of any shape and color. You need AT LEAST one die per Class chosen from the Attack, Defense and Life classes. For example, you will be able to play with one Attack die, one Defense die and seven Life dice or any other combination which includes at least one die per Class. You also need a “game board” (you can download one for free from the web site or you use the one included in the Basic blister). You can use any flat surface as a playing area, but note that the dice are particularly heavy. A heavy table cloth or some form of protection should be used on fine wood or glass surfaces. There are 9 different Types of dice. The dice Type can be distinguished by its shape. Each shape or Type has particular powers which you will use in the Skirmish phase. If you have a “red” Basic blister, for example, you will have all nine types of red dice available (three per class, that is, 3 Attack, 3 Defense and 3 Life) capable of performing all of the basic IRONDIE tactics. With any basic blister you will immediately be able to play against an opponent. You can be competitive right away, but later you can add specialized dice to improve your strategies. The objective of the game is to defeat your opponent by leaving him or her with no Life dice in play. When, at any moment of a game, a player has no Life dice left into play, that player loses the game. During the Battle phase both players simultaneously cast selected dice into Battle. Among them there must be at least one Life dice or the player is immediately defeated (Remember, having no Life dice in play means you lose the game!). During the subsequent Skirmish phase players can cast (in turn) the remaining dice kept in Reserve (in one’s hand). At this time a player can take advantage of any specific dice effects, which is summarized on the Game board. During the Skirmish phase players take turns declaring Duels. They do so throwing a dice and declaring a target dice (chosen from the player’s own dice or those of the opponent). If the dice cast during a Duel obtains a higher value than the target die, his effect must be applied. Each Duel consists of two subsequent casts for each player. Player “A” casts a dice, player “B” can counter back, “A” can further counter, and finally “B” can make a last move. The Skirmish phase, maybe the most complex part of all IRONDIE, is explained in a more detail in the Manual. During the final phase, called Damage Assessment, each player subtracts the sum of his or her Defense dice from the sum of his or her opponent’s Attack dice. If the result is a positive number, the player who has received the damage must subtract it, distributing the damage as he or she pleases, from his or her Life dice (for example, if the sum of your Attack dice is 9 and that of your opponent’s Defense dice is 4, you will inflict 9-4 =5, or 5 damage points). When the points of a Life die are reduced to zero, that die is declared destroyed and must be put into the Abyss! The dice come in three Classes (Attack, Defense and Life), in nine Types, and in 8 different Colors. Every color is usually specialized in one of 9 effects which creates many possible playing combinations. For example, Black is connected with the Smasher, a very powerful die which can be dangerous also to its owner. A player who wants to make the most of a Smasher will privilege a black dice, even if this will make his or her game more predictable and cause some disadvantages in the composition of the Set. To keep track of player moves and to avoid misunderstandings or tricks, there is a Game board (“carpet”) included in every Basic blister. It can also be downloaded and printed from the web site. Expert players can do without the Game board as long as they arrange their dice neatly, as if they were playing on the Game board itself. The Game board must be used in tournaments. If possible, it is recommended to use it in every game, and a player can always request that his or her opponent use the Game board. 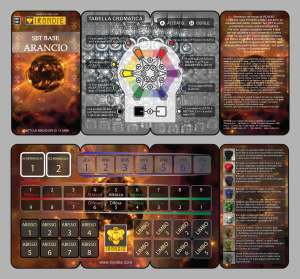 The Game board illustrates the playing zones: Battle (composed of Attack, Defense and Life zones), Abyss, Limbo and Skirmish. The Attack, Defense and Life dice are placed respectively into the Attack, Defense and Life zones as soon as they have been cast into Battle at the beginning of the turn. Those dice which have been destroyed and cannot be used for the rest of the game (defeated Life dice or those dice destroyed by a Smasher, for example) are to be put into the Abyss. All dice in the Skirmish zone at the end of each Duel (unless destroyed) and all dice in the Attack and Defense zone at the end of each turn are to be put into Limbo. Finally players keep track of the dice used in the Skirmish phase by placing them in the Skirmish zone. When the confrontation between one die and its target during a Duel ends in a draw, the target die wins; in other words, a dice cast during a Duel must obtain a higher value than the target die in order to win the Duel and apply his Effect. This is true as long as the rules of “Specialization” are followed, as will be explained further in the text. Colors are divided into 3 Categories: Primary colors (Red, Yellow and Blue), Secondary colors (Purple, Orange and Green) and Non-colors (White and Black). The Categories define the relationship between the Colors. According to color theory, Colors are related to each other according to a “degree of kindred”: two Primary colors are the “parent” colors of a Secondary, and a Secondary color is the “child” of two Primaries. For example, Red and Blue are the parent colors of Purple, Green is the child of Yellow and Blue. Black and White have no degree of kindred with any other Colors. According to their relationship, there are Allied colors (as the parent colors to their children and vice versa), and colors which are Hostile to one another (as the colors within the same category: Red is Hostile to Yellow and Blue, Orange is Hostile to Green and Purple, Black is Hostile to White) and finally there are colors which are Neutral to each other (as are those colors which are not Allied nor Hostile to one another like, for example, Yellow and Purple). The best way to get used to this idea is to turn to the Chromatic table which illustrates this concept that might already be familiar to those who have a background in art, graphics or photography. Every time a die throw scores “1” it generates a particular effect, related to its color. Every time a die throw scores “1” the effect generated by its color (according to what is stated in the Chromatic table on the back of the Game board) must be applied, whenever possible, to any Allied die (but never to itself). This rule, called the “1 rule” has to be applied as soon as the die is cast on the Game board and before any other Effect (for example a die cast during the Skirmish phase). For example: I cast a Red die and score 1. 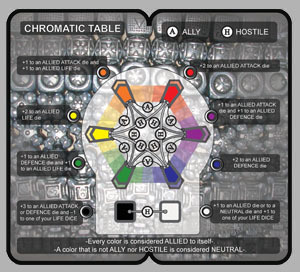 The Chromatic table shows that I can give a two-point bonus to one of my Allied Attack dice, so if I have another Red, Purple or Orange die in my Attack zone, I can add 2 points to its value. Consider that in Expansion Sticks you might also find some Rare dice, which apply this rule even when the die scores 2! Besides the effects of the “1 rule”, each Color has a Specialization related to the die Type (defined by the dice shape). 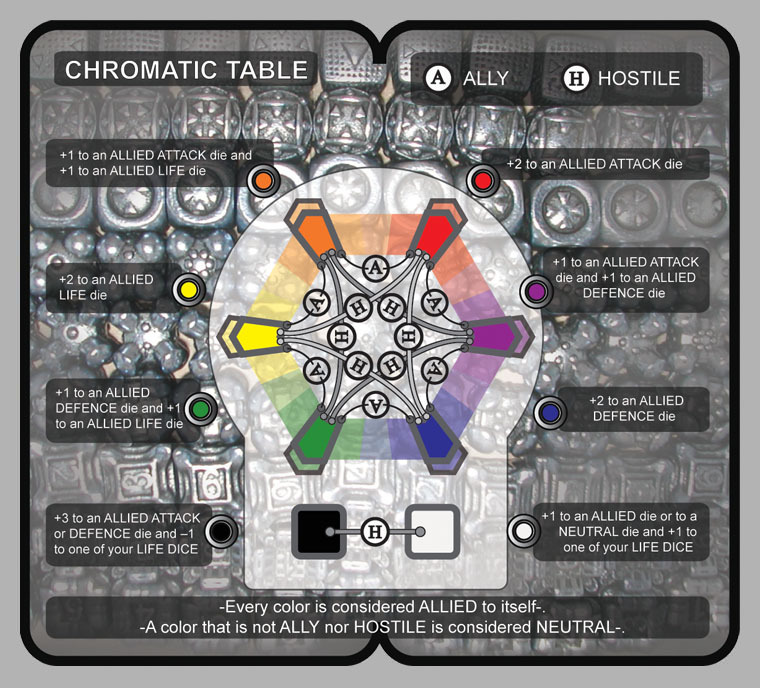 You can determine the Specialization for a particular die color with the table on the Game board. The table has a summary of types and effects. As you can see Black is “specialized” as Smasher, Red as Assault and so on. A specialized die (that is a die with the best color-type combination: a Black Smasher, a Red Assault, etc.) breaks the draw rule defined in the Skirmish phase instructions. This means that whenever a Specialized die targets another die, it wins when there is a draw from the roll. For example: a Black Smasher targeting a Yellow die wins even if it rolls the same value as its target die; this can happen because Black is specialized as Smasher. The Specialization rule has an exception: it doesn’t apply while targeting a Hostile die. To be clear, here is another example: a Black Smasher targeting a White die loses when there is a draw from the roll because White is Hostile to Black.